How many times have you forgotten to switch of your head lights? And you only remember it when it is to late and the battery is flat or when you have locked the doors and is on your way . All you need is a diode 1N4007 and a 12 Volt buzzer. And some wire. Start by connecting the buzzer and diode in series as show in the picture. If the buzzer and diode is connected to a battery it will buzz. But if you turn the polarity around on the battery then nothing should happen. This is because the diode is blocking the flow of current. 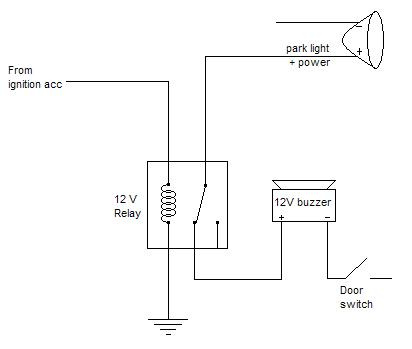 If you take the Positive lead of your park lights and connect it to the diode permanently and just for testing purposes connect the buzzers negative lead to the ground (negative of the battery) and you switch on your lights the buzzer should buzz. But that is not what we want. We want the buzzer to buzz only if the lights are on and the ignition is off. Disconnect the buzzers negative lead from the ground (negative of the battery) and connect it to the ignition switch. Test with the tester to make sure you get the right wire that only has power when the ignition is switched on. Or alternatively connect it to the wire that feeds the car radio. Providing that the car radio only work when the ignition is switched on. Now if you switch the lights on while the ignition is off the buzzer should sound. And as soon as you switch the ignition on the buzzer should stop. Hope this will help you from forgetting your lights on in the future.